The last few years, even months, have seen radical changes in commercial arbitration in almost every Latin American jurisdiction. International Arbitration in Latin America is a first of its kind publication that provides the lawyer, arbitrator, and businessperson with a thorough overview of the current status of international arbitration in the region. Freshfields Bruckhans Deringer's Nigel Blackaby, Clifford Chance's David Lindsey, and Argentine lawyer Alessandro Spinillo have joined with others in the field of arbitration in Latin America to compile the first comprehensive review of commercial arbitration in major Latin American jurisdictions as well as notable developments in the use of arbitration mechanisms contained in bilateral and multilateral investments treaties and free trade agreements. The book provides not only a detailed analysis of the law, but also insight from local practitioners into the culture of arbitration and how the law is applied. 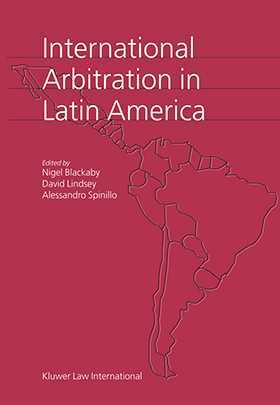 it also describes the increasing use of alternative dispute resolution in Latin America and how it might be best used as a complement for arbitration proceedings, with an emphasis on complex projects where staged dispute resolution might be appropriate.